Scientists at the SUNY College of Environmental Science and Forestry (ESF) are getting some help from Xerox Corporation (NYSE: XRX) as they seek to make inexpensive biodegradable plastics from byproducts of wood-based ethanol production. Through the Xerox Foundation, the company has awarded the college a $20,000 grant, which can be renewed for two more years, to explore "Biodegradable ‘Green Polymers’ from Renewable Resources." It’s one of 11 new fundamental research projects at universities around the world that Xerox has selected to fund as part of a 20-year-old, open innovation program that promotes university and industry interaction and enables Xerox to partner with academic luminaries. 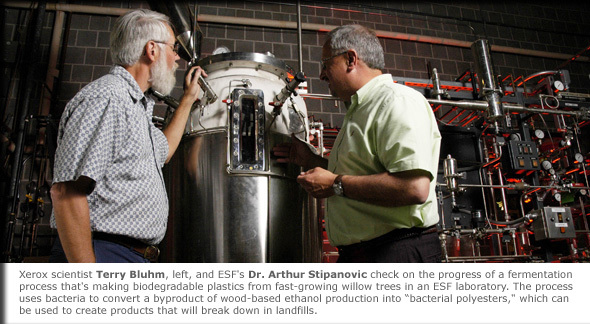 The SUNY-ESF project, under the direction of Dr. Arthur J. Stipanovic, is particularly timely. Rising gasoline prices have spurred interest in ethanol as an alternative fuel; and woody biomass, such as fast-growing willow trees, other hardwoods and switchgrass, may be preferable to using corn to make ethanol. When the cellulose in woody plants is converted to ethanol, a second substance in the plants, called hemicellulose, is a byproduct, according to Dr. Terry Bluhm, a principal scientist at Xerox and the Xerox sponsor of the project. Bluhm, who is also an adjunct professor at SUNY-ESF, knew that his colleagues there were working on processes that use bacteria to convert the leftover hemicellulose to “bacterial polyesters.” These materials are thermoplastics, similar to PET (polyethylene terephthalate), a plastic that is widely used to make rigid and flexible products, including beverage containers. Bacterial polyesters are a good-news, bad-news story. In contrast to PET, bacterial polyesters will biodegrade when exposed to bacteria and moisture in landfills. But they are expensive to produce and their properties aren’t yet suitable for most commercial applications. With the Xerox grant, SUNY-ESF will investigate ways to increase the commercial potential of the bacterial polyesters and hemicellulose itself as a biodegradable material. They are hoping to develop a manufacturing process that improves yields, increases throughput and decreases costs. “We envision that this project will yield high performance, lower cost biodegradable materials useful for disposable consumer applications and packaging,” Bluhm said. "Research collaborations between industry and academia are vitally important in keeping academic researchers in tune with ’real world‘ technology challenges while creating a window for industrial colleagues to see what's in the future technology pipeline,” Stipanovic said. "By supporting research at academic institutions, private industry helps create new training opportunities for the scientists and engineers of the future." Xerox could ultimately benefit, too. Virtually all its hardware products and many of the components in them contain plastics made from petrochemicals. If it were possible to substitute biodegradable plastics made from renewable resources such as wood, Xerox could make its products even greener, Bluhm said.